The idea of turning oil into salt may sound like something that should be done in a science lab but Dr. Gal Luft says it’s something that Congress can do with a simple piece of legislation. 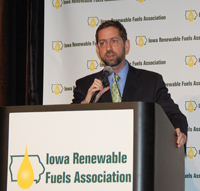 Luft, who is executive director of the Institute for Analysis of Global Security, explained his analogy between oil and salt at the 6th Annual Iowa Renewable Fuels Summit in Des Moines on Tuesday. That’s why Luft strongly advocates the simplest solution to diminishing the stranglehold oil has on the transportation industry, and that is requiring all new vehicles sold in the United States to be capable of running on a variety of fuels. “Whether it is ethanol or methanol or butanol, whatever it is, let’s give people choices,” he said, noting that there is just such a bill pending in Congress called the Open Fuel Standard Act. Luft and co-author Anne Korin wrote a book about the analogy between salt and oil and the importance of fuel choice, called “Turning Oil into Salt”, which was reviewed here on Domestic Fuel in 2009.